Since the Olympics start today in London, a sport-themed story seems appropriate. This, then, is the tale of my single greatest accomplishment in sports: the day I became the Tiger Woods of mini-golf. Back in 2003, when Sylvia and I first started dating, we drove down to the hot springs at Radium, British Columbia. 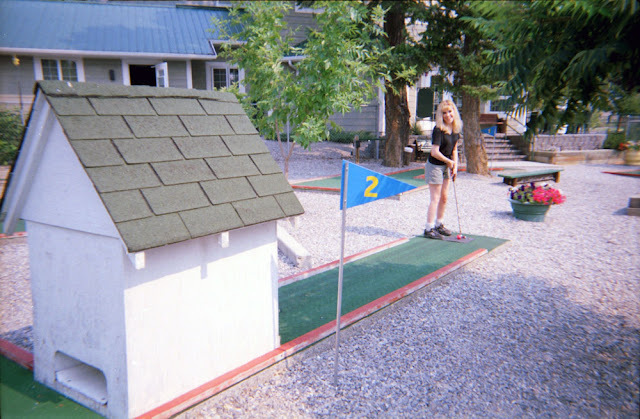 There was a mini-golf course next to our hotel, so Sylvia and I ambled over to give it a try. Astounding Sylvia - though no more than myself - I found myself completely in the zone, scoring several holes-in-one and only rarely missing each hole's score for par. In the end, I wound up with a final score of one under par for the course, and Sylvia immediately christened me "the Tiger Woods of mini-golf!" Sadly this performance was not to be repeated. We played another couple of rounds, but I couldn't recapture the style and finesse I'd managed during the first game. Still, Sylvia was impressed enough that I sometimes wonder if this single example of sporting prowess may have convinced her that I was a keeper. Clearly, the Earl-y birdie gets the girl.